Chromesearch1.info is the PUP that uses misleading techniques to prevent removal. Use Reimage to locate malicious components and get rid of them faster than with uninstall instructions. A full system scan blocks virus reappearance and prevents traffic to malicious domains. How dangerous is Chromesearch1.info search engine? How to keep PUPs at bay? If you’ve been looking for information about Chromesearch1.info virus, you probably already realized that it is a potentially unwanted program (PUP) that hijacks browser’s settings and keeps them under control until the user removes it from the system. However, does having this PUP on the system expose your PC to Internet hazards? The answer is yes. Now, we are going to discuss the activity of this hijacker and explain why you’re better off without this program. This picture reveals the Chromesearch1.info search engine and ads in search results provided by it. Chromesearch1.info browser hijacker inserts an extension into each of victim’s web browsers, and this extension modifies some settings in them. First of all, it sets Chromesearch1.info to be the default start page, then assigns this value to new tab page, and finally sets this page to be the default search engine provider. As a result, the browser loads that website each time the user launches a new window or tab in a browser. The discussed website provides web search service, and at first sight, it seems that this search engine is very similar to Google. It even says “Google Custom Search” on the search box. Seeing such line can trick many users into using it, however, let us explain what it actually means. 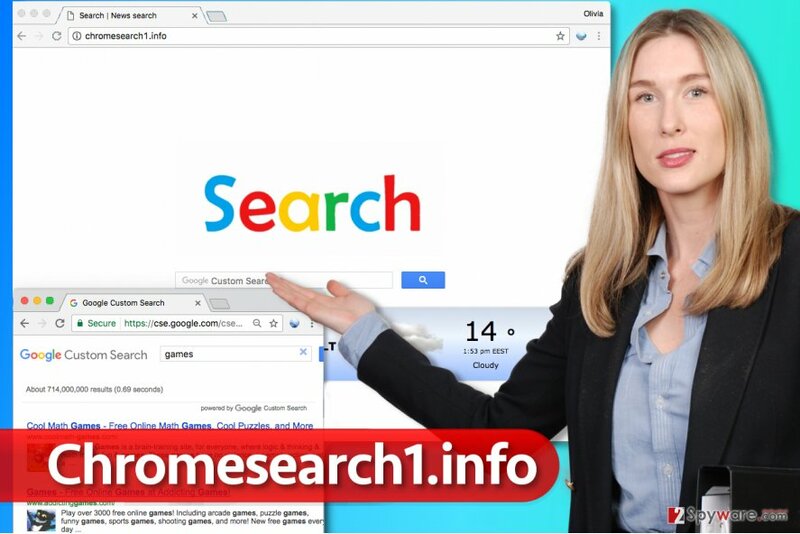 This search engine provides customized Google search results, which means that these results can be filled with additional third-party links and ads, and if you’re looking for a search tool that would provide you with accurate responses to your search queries, better sidestep this search tool and look for another one. Dealing with potentially unwanted programs is hard, so it’s for the best to keep them away from your PC system. Ideally, try to avoid installing such programs at all. Fun fact is, computer users install such browser hijackers by themselves because they fail to find hidden agreements to install them when installing other free programs or shareware. These agreements usually are provided in fine print below Default or Standard installation options, which users consider to be the most reliable ones. No matter how wrong this is, it is the main reason why computer users end up installing spyware and, in some cases, malware on their computers. Now, the easiest way to prevent this from happening is to adjust software installation settings by choosing Custom/Advanced settings and removing optional components respectively. Once you get access to the list of programs bundled with your chosen software, just deselect components you don’t need and proceed with the installation. To keep your PC free of junk, we recommend you to remove Chromesearch1.info virus and programs that were installed at the same time with it. You can do this by sorting the list of currently installed programs by date, and uninstalling programs that were installed on the same day as the defined browser hijacker. However, sometimes browser hijackers do not appear in the list of currently installed programs, so in such case we suggest you to complete a system scan with anti-malware software like Reimage and carry out automatic Chromesearch1.info removal procedure. Use this tutorial to clean optional programs from the system and also fix browser shortcuts that may had been altered by this browser hijacker. Here, look for Chromesearch1.info or any other recently installed suspicious programs. Wait until you see Applications folder and look for Chromesearch1.info or any other suspicious programs on it. Now right click on every of such entries and select Move to Trash. In IE, look for extensions that were installed without your knowledge. It is highly recommended to remove extension called Chromesearch1. When in the new window, check Delete personal settings and select Reset again to complete Chromesearch1.info removal. Once these steps are finished, Chromesearch1.info should be removed from your Microsoft Edge browser. Here, select Chromesearch1.info and other questionable plugins. Click Remove to delete these entries. Now you will see Reset Firefox to its default state message with Reset Firefox button. Click this button for several times and complete Chromesearch1.info removal. Open Chrome settings and navigate to Extensions tab. Remove Chromesearch1 and associated extensions from the list of currently installed extensions. Here, select Chromesearch1.info and other malicious plugins and select trash icon to delete these entries. Click Reset to confirm this action and complete Chromesearch1.info removal. Here, select Extensions and look for Chromesearch1.info or other suspicious entries. Click on the Uninstall button to get rid each of them. Here, look at the Homepage field. If it was altered by Chromesearch1.info, remove unwanted link and enter the one that you want to use for your searches. Remember to include the "http://" before typing in the address of the page. Now you will see a detailed dialog window filled with reset options. All of those options are usually checked, but you can specify which of them you want to reset. Click the Reset button to complete Chromesearch1.info removal process. ^ PUPs - Potentially Unwanted Programs - Basics. McAfee Communities. A Community of Solutions and Experts. 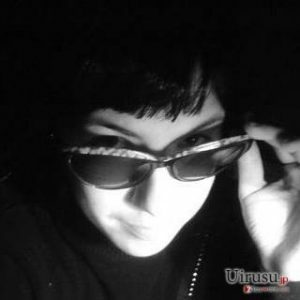 ^ Hackers, virus writers and internet criminals. BullGuard. Internet Security & Web Site Security Articles. ^ Alice Woods. Why you should avoid Delta Search and other fake search engines. 2-Spyware. Fighting Against Spyware and Malware. ^ Wendy Boswell. How do I avoid dangerous websites?. Lifewire. Tech Information Website. This entry was posted on 2017-04-05 at 04:41 and is filed under Stealing programs, Viruses. You can quickly scan the QR code with your mobile device and have Chromesearch1.info virus manual removal instructions right in your pocket. How did you remove Chromesearch1.info virus?